Samsung announced industry's first 30nm DDR3 memory chips, mass production is slated for the second half of this year. “Our accelerated development of next generation 30nm-class DRAM should keep us in the most competitive position in the memory market,” said Soo-In Cho, president, Memory Division, Samsung Electronics. The 30nm-class process when applied to DDR3 mass production raises productivity by 60 percent over 40nm-class DDR3. This will result in a doubling of production cost-efficiency compared to DRAM produced using 50nm to 60nm-class technology. The 30nm-class 2Gb, Green DRAM reduces power consumption by up to 30 percent over 50nm-class DRAM. A 4-Gigabyte (GB), 30nm module when used in a new-generation notebook will consume only three watts per hour, which is just three percent of the total power usage of a notebook. 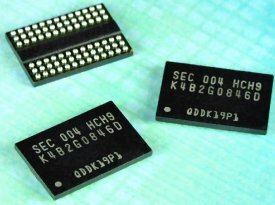 The new DDR3 will be used in a broader range of products, from servers to notebooks, desktops, and future versions of netbooks and mobile devices.